But at the shop "Height 170, Waist 105, Heso around 115" There is nothing that matches the metabolic uncle of Mr., and I encountered while looking for it with Net BigSite and this product. ◆ After comparing various reviews of similar products and thinking about it, this product of Komine, "There seems to be a size that will suit me" (It was a comfortable size when 2XLB was chosen!) , "Protector rich, functional and cheap" , I judged and bought it. When the product arrives, please try, "It was good to do it!" And conviction. I have not taken a Motorcycle yet, but I'm sure you will be satisfied. ▲ "Even in the summer Black" Color choice is irrationality. I want other colors to be displayed within the range where dirt is not a noticeable color. ▲ I want Knee's Pad to be able to be raised further and fixed. ▲ I want you to attach a detailed use instruction manual, including an explanation that there is an adjusted Magic tape also on the upper side of Knee inside. ▲ Quantity : Pair (for Left and Right) I want Pad for waist so that it can be fixed inside Pants (It will become obstructive when you wear it) - - - - All these together ★ One deduction point. The good place is ◆ WaistQuantity : Pair (for Left and Right) Magic belt adjustment range is wide. ◆ Although there are many Pads, they are not disturbing comfort. ◆ Quantity of diagonal Zipper : Pair (for Left and Right) Previous Pocket is better. ◆ Logo is very modest and very good! (Fancy Logo makes you feel uncomfortable) ◆ One point of Red is Fashion. ◆ Height Length Adjuster is a pleasing consideration. ◆ Good lighter. ◎ "Outerwear Connection Fastener" I do not use it, but it does not get in the way. ◆ Komine's "Size table" It is detailed and easy to understand. Casual design is very good I purchased it because I wanted Riding Pants for summer. Just watching it looks like just Chino pants. Since the material of the fabric is not bad, I think that there is no problem with everyday use without Protector if there is no Reflector? On the back side. Regarding Size, I am Jeans at Lee Vise Jeans and I am just right at Size 29, but I chose Size 30 for this product. Waist has a slight remainder but below it is a Tight making so there is not much room. However, because it is a Stretch fabric, there are some stretches and it is not that it is hard. Therefore it would be better not to buy a person who is honestly fat. Because there is a reasonable length, there is a surplus if it is an average Japanese style. Although the overall Balance is good, I thought that it was better if the interior Mesh fabric was partial and all around, or if it was from the top to the bottom on the front side. I think that it is a good product as a whole so I would like to use Season Don Dong now. There is no problem on town walking. Jacket used something with Protector, but because he did not care about Pants at all, he thought that it was a good opportunity and thought that he had a sense of incongruity in the street walking, he selected this item did. I feel just fine with Jeans and Size same as I usually wear. It is slightly tight building compared to Jeans, but there is also no problem with elasticity. Although it is a day off, Soft protector is also equipped on the knee. Although it seems not so breathable, I think that there is also comfort of Sokosoko because it is interior decorated with T-DRY. 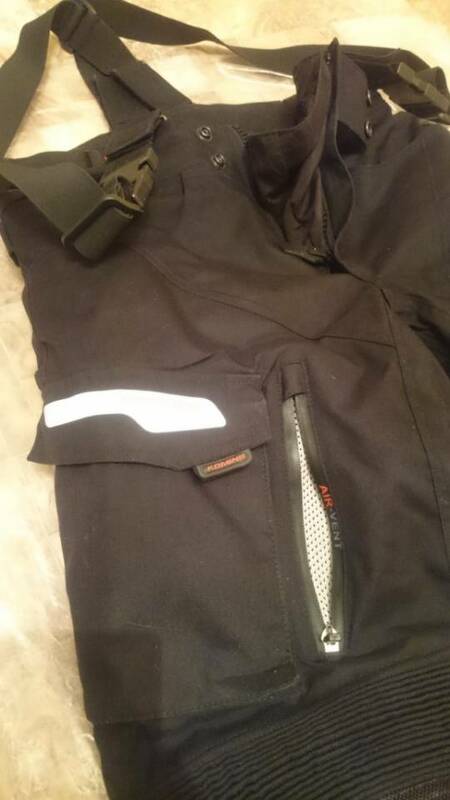 High price, warm keeps warmth and thinness 2013 / 12 / After purchasing to 15, I used it for driving and Snowboarding Motorcycle. What I have is the product before Minor change. It feels like I wore under KUSHITANI 's Country jeans It is about half the thickness of Jersey. If you say that you feel SilverMatte wrapped around your legs, it is overwhelming but the insulation is close to that. And to the present it is just washing normally, but the warmth retaining property has not deteriorated. Somewhat, feeling that the fabric sticks even if I sweat did not bother me much. After use it seems to be a good product, but price is a problem. I thought it would be nice if it would be nice to combine my toes and heels with the notched socks. It will be fine if it properly connects with Outerwear. This product is recommended for those who have the company's Outerwear. Good all-season pants. Very comfortable. Removable warm lining the entire length of the legs. Ventelyatsionnye valves on hips. W... Good all-season pants. Very comfortable. Removable warm lining the entire length of the legs. Ventelyatsionnye valves on hips. Waterproof layer is not removable, in the summer they may be hot. Bright reflectors. Thick fabric, especially in the knees. ZIP castle on the back. Spacious waterproof side pockets. Convenient tightening at the waist if you decide to lose weight. For winter I have Thailand 's DRYMASTER Cargo Pants for All seasons, but I bought this product for winter. The fabric itself is a little thin and I do not think it is for winter, but the back side is Quilting (Batting) It is warmer than at least Jeans. If you wear Tights it will be a margin up to 5 to 6 degrees Celsius. Though it may be a matter of preference, the surface is somewhat shiny, it has matt and thickness of the fabric Thailand Chi is more like Jeans and I like himself. Knee Pad seems to be removed for uncomfortable feeling, but many people use it, but this product was exactly for me. Deep behind Pocket and light wearing feeling makes it convenient.